Vale (NYSE:VALE) has been hit hard by falling commodity prices. It's been working to adjust, but that job never seems to be complete. And now things are looking even more grim. Here's why you aren't likely to find much to like about Vale's earnings when it releases them on Feb. 25. The most obvious issue for Vale has been falling commodity prices, particularly for iron ore. That segment of the company's business accounts for roughly two thirds of revenues. But, even more concerning, it accounted for nearly 90% of the company's EBITDA in the third quarter. In other words, as iron ore goes, so goes Vale. Iron ore hasn't been a great business. To get an early read on just how bad things could be for Vale, take a quick read of Rio Tinto's (NYSE: RIO) recently released earnings. The company's iron ore price realizations in 2015 declined roughly 42% year over year. That price drop led to a 45% EBITDA decline in Rio's iron ore business. While you can't blame Vale's dim outlook on Rio (Micheal Caine in the movie Blame it on Rio? Anyone? ), it certainly sheds some light on what to expect when one of the world's other giant iron ore miner reports. No matter what else gets said, iron ore prices are going to be the headline driving factor in Vale's weak 2015 results. But there's more to attend to than just that. For example, Asia accounts for a little over 50% of Vale's revenues. China alone was nearly 40% of the total in the third quarter. This heavy exposure drove results upward when commodity prices where high and demand from Asia was robust. But it's not a good thing right now. China's economy has been slowing down, and it looks as if things are continuing to get worse despite the country's efforts to support the economy. So when you look at Vale's earnings, pay particular attention to Asia and, specifically, China. Don't expect good news; The real question is, how bad is it now? As if these two issues weren't enough, Vale is half owner of the Samarco mine in Brazil. Late last year a storage facility for mine waste at Samarco ruptured, causing material damage to several towns and taking lives. Vale and 50/50 co-owner BHP Billiton (NYSE:BHP) have been taking steps to help resolve the crisis as best they can. However, that won't stave off the lawsuits. Brazil has started that process already, looking for around $5 billion in compensation. However, it's probably better to think of that number as a starting point in what is sure to be a long and drawn out process. Vale and BHP are trying to limit the damage by saying that Samarco is a separate company, which it is, so they aren't directly liable. That's not going to stop anyone from suing and probably won't afford too much financial protection when all is said and done. However, to get an update here you'll want to pay attention to management's comments during the conference call. That's because the nature of the issue means management will try to say as little as possible about Samarco. Thus, answers to analyst questions are where the real update is likely to come from. Trying to turn a frown upside down, you'll also want to look at Vale's achievements on the cost side of the equation. Because of the deep commodity downturn, Vale, like all of its mining peers, has been pushed to make drastic cuts to spending. Rio, for example, trimmed its capital budget over 40% last year. Look to see how deep Vale was able to cut. But that's not the end of the story on expenses. Vale has continued spending money to increase low-cost production, with its most notable project being S11D. That project was roughly 75% complete at the end of the third quarter. Listen for the progress being made because, once complete, Vale could displace production from higher cost mines and move further down the cost curve. That would be good news, particularly since iron ore prices remain in the doldrums. Then there's the not so subtle issue of finances. 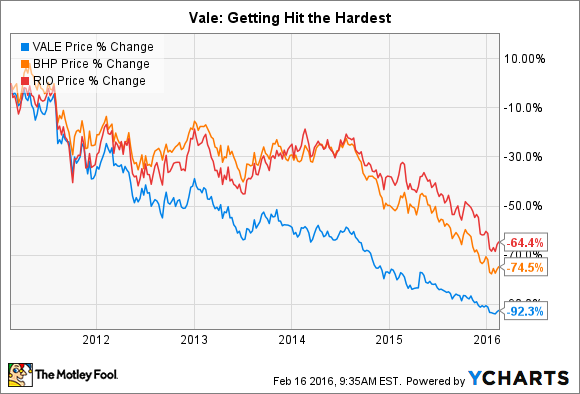 Vale, like many of its peers, is trying to shore up its balance sheet. So pay attention to asset sales and other similar transactions, like the nearly billion-dollar steaming deal it inked in early 2015 with Silver Wheaton (NYSE:SLW). It's hard to describe selling core assets like cargo ships and the future gold it produces from a key mine as a positive, but Vale is doing the right things in a bad market to ensure it survives. Listen closely for updates here and the impact its efforts are having on the balance sheet. So when Vale reports earnings on Feb. 25, don't expect much good news. But pay close attention to how ugly things are getting. That spans the company's large iron ore business, its heavy exposure to China, and the mine disaster at Samarco. Look for silver linings on the spending, finance, and expansion front, but these are really just small positives. Indeed, the company's earnings results are likely to show that Vale is currently in full-on survival mode.